Since the weather doesn’t seem to be improving any, we’re stuck in soupsville for however many weeks it’s going to take Spring to warm things up enough to let us enjoy salads at lunchtime. 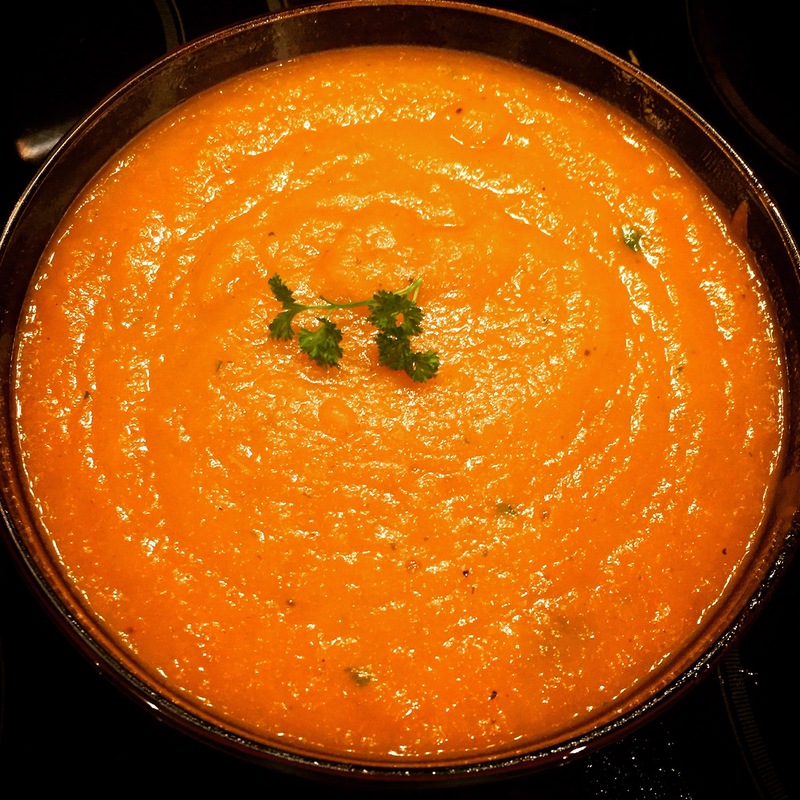 This is a swings and roundabouts problem, however, because the soup gets made on Sunday, and then portions will need to be reheated each day for lunch, whereas salads necessitate chopping and boxing every evening when supper’s being made, and there often needs to be a roast bird in the oven on Sunday to provide the protein element. So either way, this is my hardest work part of eating well. All that work pays off, however, as long as you can keep changing things up enough that you keep enjoying whatever it is you’re feeding yourself. 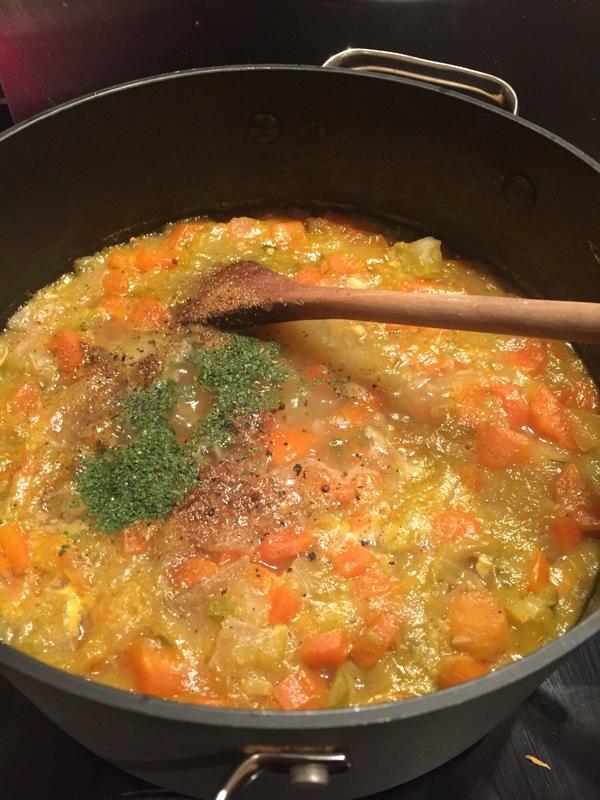 And that’s why it’s time for a new soup! 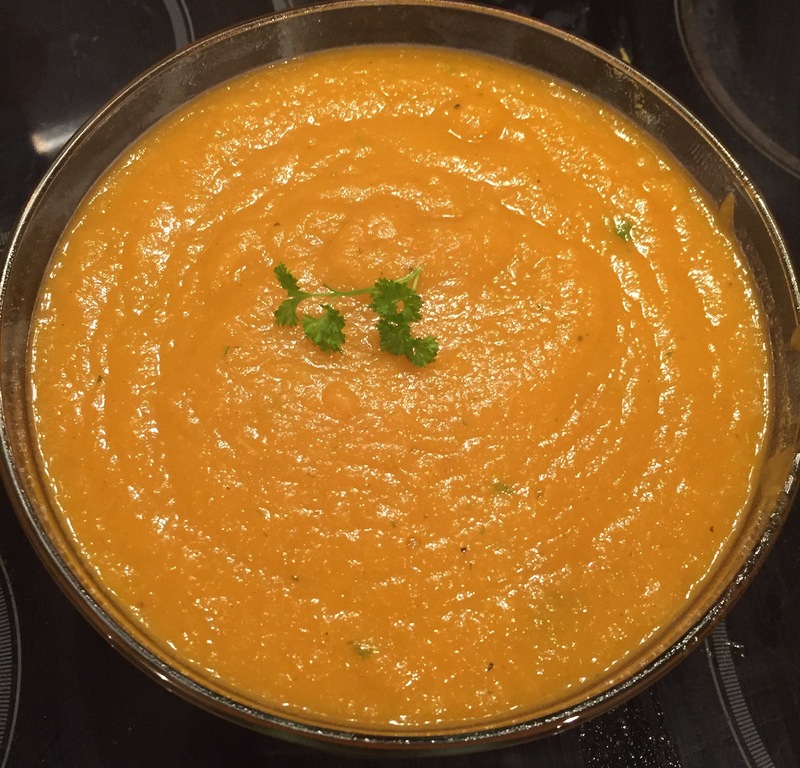 You don’t me need to tell you that carrots help to see I the dark but you may not know that they are packed with vitamin C. They can be a little sweet, however, so to me it makes sense to balance them out with a little heat and some acidic citrus to give you a tasty well/rounded soup. 1. 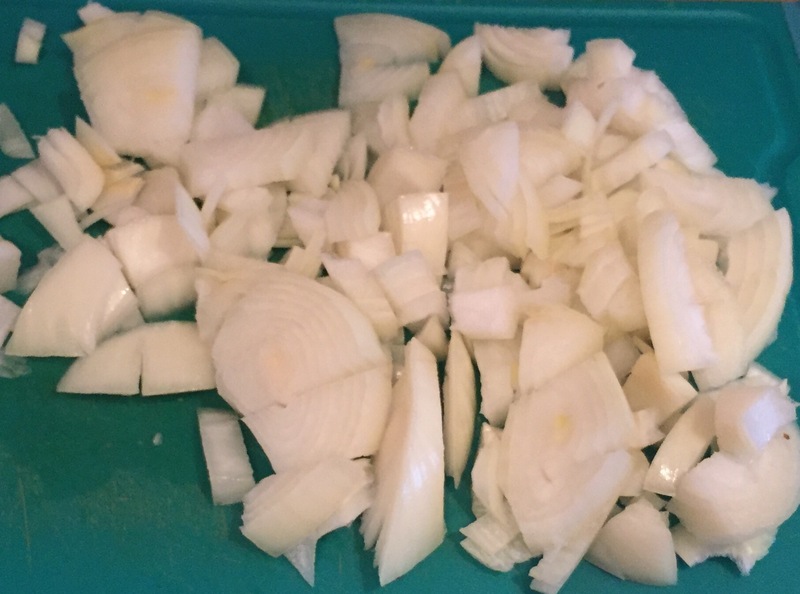 Chop the onions, garlic and ginger. Don’t worry about being too delicate or even – it’ll all blended once it’s cooked. 2. 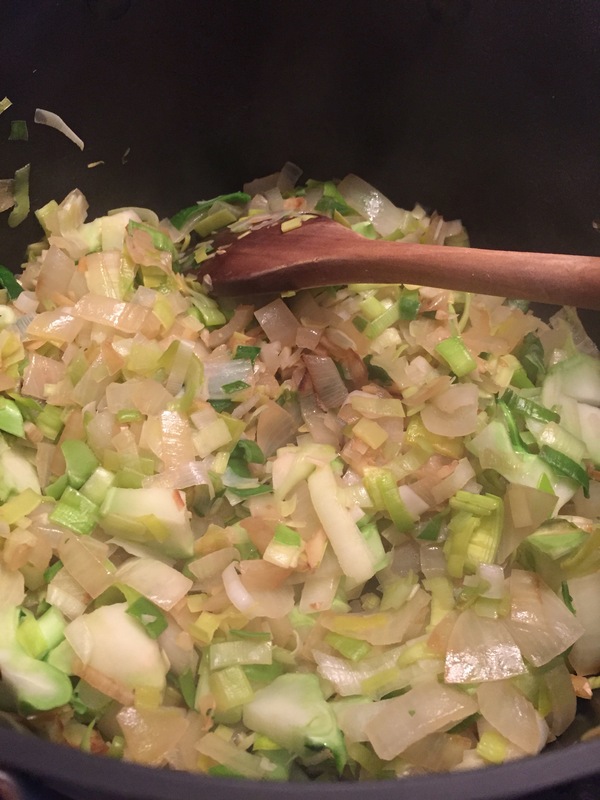 Add a tablespoon of oil to your soup pot and chuck in the onions, garlic and ginger and cook on a medium to high heat until it’s all starting to turn transparent. 3. 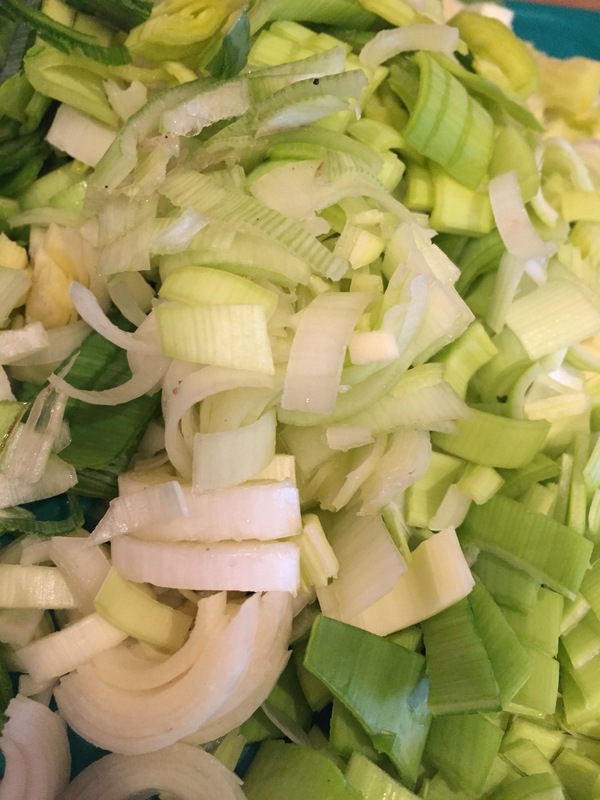 Chop the leeks – make sure you rinse out any mud and trim off the toughest part of the leaves. 4. 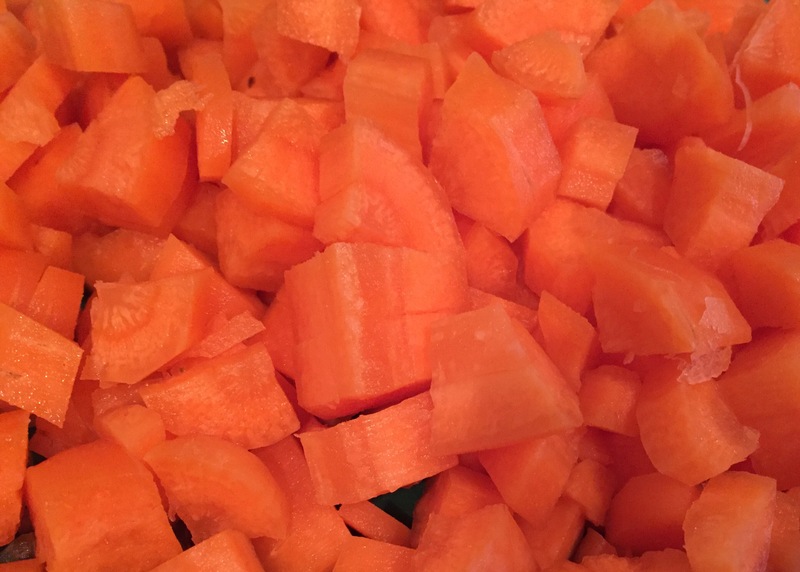 Peel and chop the carrots – you can leave the skins on if they’re not too gnarly – just give them a quick wash.
6. 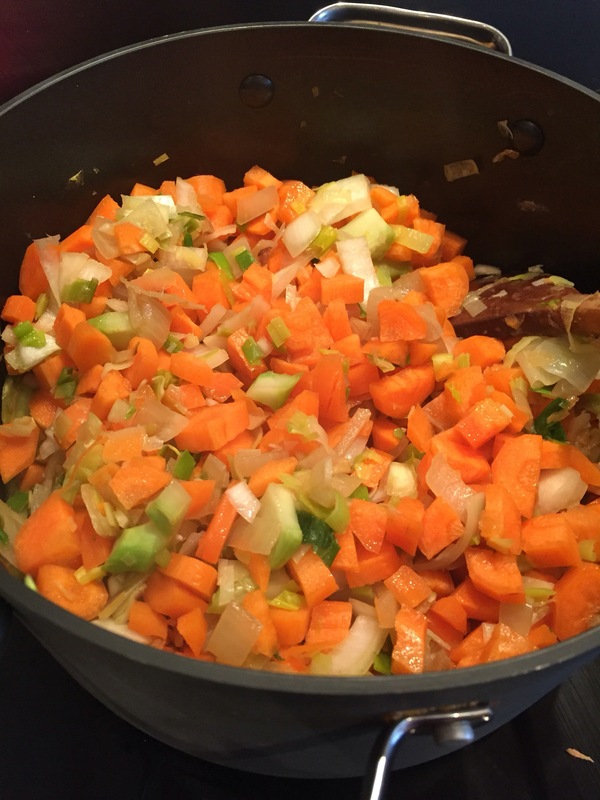 …then add the carrots and stir it all together. 7. 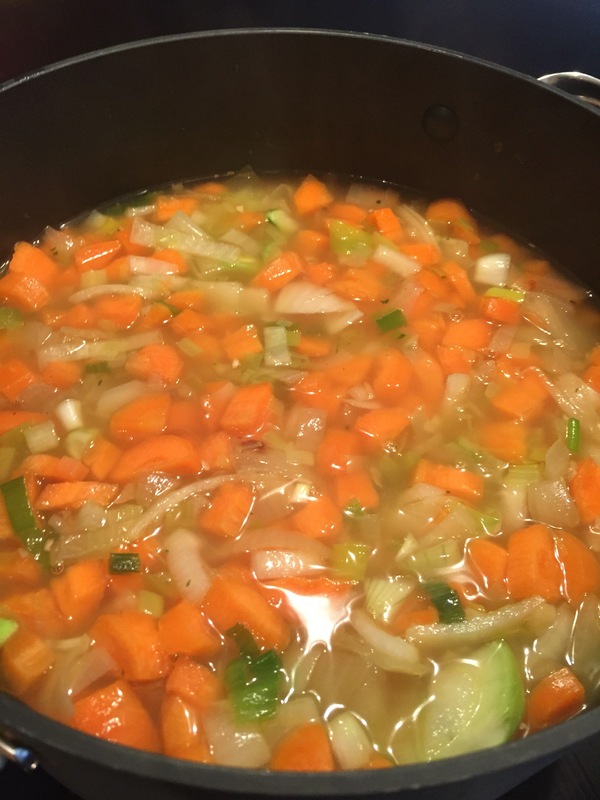 Make the stock by dissolving the stock cubes in water, then add to the pot, topping up with more water if necessary. I used about a litre and a half. 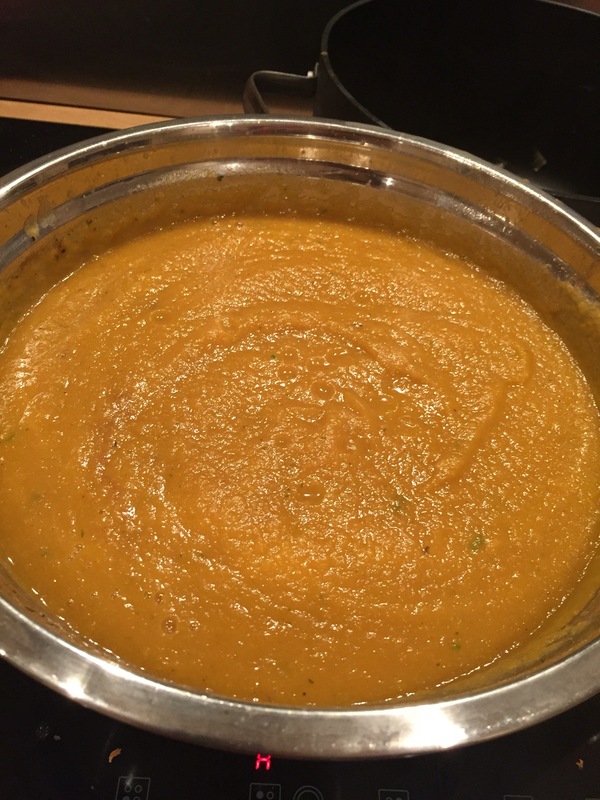 Put a lid on and leave to simmer on a low to medium heat for 40 minutes to an hour. 8. Add the parsley and spices to the pot and take it off the heat. Now it’s time to turn this hitch pitch into a smooth soup. You can do that by pouring it into a blender or by using a stick blender. 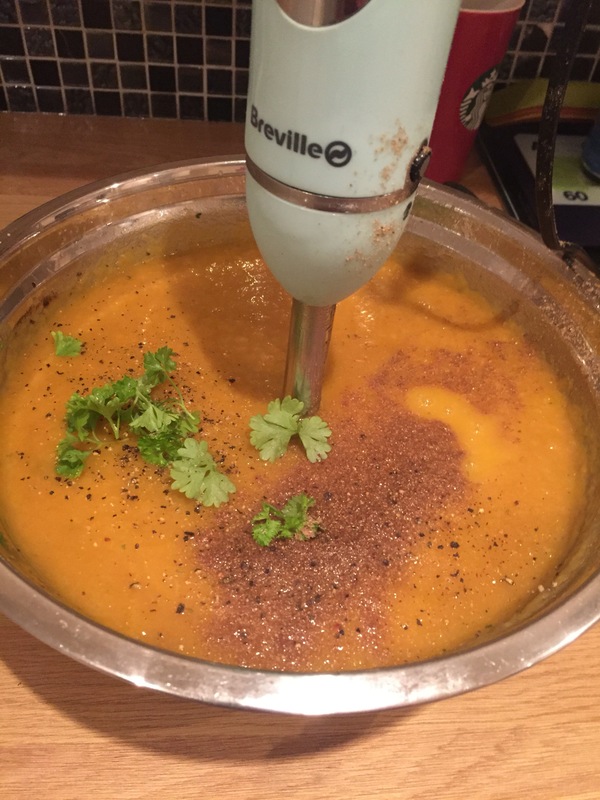 I like to use a stick blender and decant the soup into a big bowl before blending to avoid getting my soup pot scratched. 9. Add a little more water if it’s all looking too thick. I added some fresh parsely leaves at this point just to freshen things up, but you could use fresh coriander if you like it. I tasted it for seasoning and added some more ground coriander at this stage but I’ve accounted for it in the overall measurements above. Add seasoning, Worcestershire sauce and the orange juice and mix together. 10. Taste, and add anything you feel is missing. 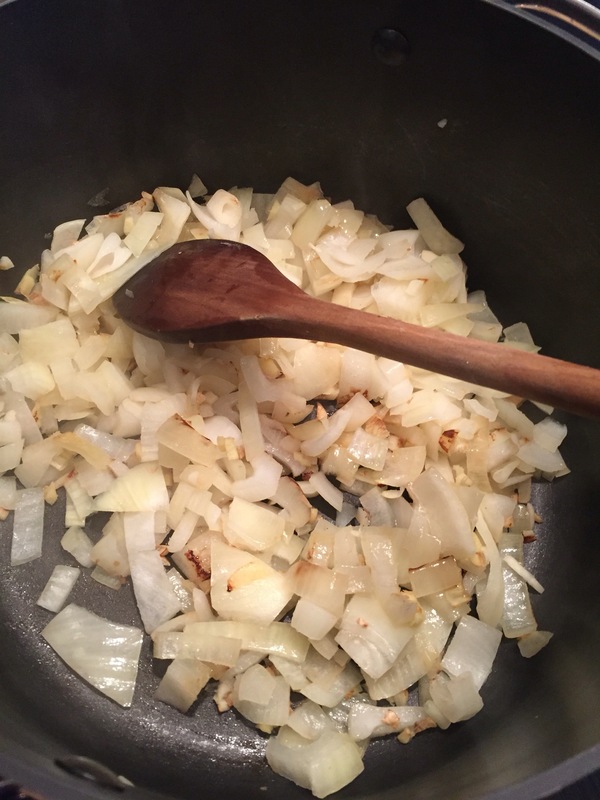 If it’s a little bland, add seasoning. If it’s not spicy enough for you, add more coriander or chilli, or if you think it needs more zest, add a splash of orange juice. Serve up and enjoy!